The setting for the game Kanban: Driver's Edition is an assembly line. The players are ambitious managers who are trying to impress the board of directors in order to achieve as high a position as possible in the company and secure their careers. With promotions come advantages at the factory, such as more space to store precious materials and greater prestige to accelerate your ascent. Through solid management, you must strive to shine next to your peers. You need to manage suppliers and supplies, improve automobile parts, innovate — anything to stay on the cutting edge, or getting your hands greasy on the assembly line in order to boost production. You must exercise wisdom in choosing which projects you should start, selecting only those that will give you the upper hand and shunning those that will bog you down or cause the unthinkable — failure — which would diminish you in the eyes of the board. Over the course of the game, you persuade the board and the factory tender to help you develop and improve automobile parts. You make shrewd use of the outside suppliers and the limited factory supplies in order to appropriate needed part when the suppliers come up short. Because the factory must run at optimum efficiency, production doesn't wait for you or for mistakes. Like the process itself, Kanban proves to be both innovative and rewarding. * The factory manager is a game-driven non-player character with two modes of play ("nice" or "mean") to offer a friendly or more competitive gameplay environment. * Two independent player-influenced game timers — the factory production cycle and work week clock — provide timing tension to the game, trigger intermediate scoring phases, and factor into the game end conditions. * A simulation of the factory assembly line with spatial point-to-point movement adds an element to the game that requires optimal timing. * A design and innovation department, leveraged to manipulate the value of the various car models and component upgrades produced within the factory, drives the economy of the game. * Departmental training and certification tracks provide players a means to operate more efficiently. If you want a seat on the board someday, you need to show that you can keep a complex machine running smoothly, efficiently, with everything happening just at the right time. 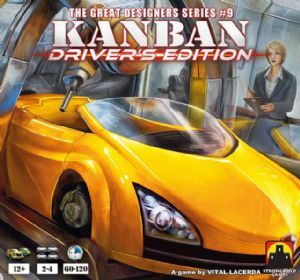 Kanban: Automotive Revolution is a pure Eurogame focused on economics and resource management that puts you in the driver's seat of an entire production facility, racing for the highest level of promotion. * New custom wooden sculpts for each of the model cars. * Double-sided game board, with one side being more "beginner friendly". * Tweaks to "Nice Sandra" mode.